Here as a basic breifing on Corvair flight engines for builders getting a first look at using one. Above, A 3,000 cc Corvair flight engine. I built this particular one for the SPA Panther aerobatic aircraft, and has powered the prototype aircraft through it’s introductory season. The Corvair is a popular option on more than 20 different experimental airframes. – Configuration: The engine is a horizontally opposed, air-cooled, six cylinder configuration. We only promote its use as a simple, direct drive power plant. The engine configuration is very similar to Lycomings and Continentals. – Displacement: The engine is effective without a gearbox or belt drive because it has a comparatively large displacement. We have versions that are 2,700, 2,850 and 3,000 cc. The smallest of these are twice as big as a Rotax 912. – Power: Corvairs have three different power ratings. 100, 110 and 120 hp. These correspond to the three displacements. They make their rated power at 3,150 rpm. They have wide power bands, making 75% power at 2,650 rpm. All engines will exceed their rated power at higher rpm, and they can be continuously run at full power at 3,600 rpm without damage. – Weight: The engine weighs 225 pounds ready to run. This is effectively the same as a Continental O-200. It’s installed weight is 35 pounds more than a 912 Rotax, 25 pounds more than a Jabaru 3300. The Corvair is 40 pounds lighter than a Lycoming O-235. 3,000 cc Corvairs are slightly lighter than 225 lbs. because we have special cylinders made for them which make these engine 5 pounds lighter. – Reliability: From the factory, the Corvair made up to 180 HP in the car and turned more than 5,500 rpm. The engine is reliable and long-lasting because we are only operating at 60% of these levels. Conversion engines that run at the car’s red line rpm historically have short lives and cooling issues. – Cost: We sell complete engines from $9,750 to $11,750. However, 90% of our builders assemble their own engines working from our Conversion manual, DVDs, parts and support and a rebuildable core engine they pick up locally. Typically, they budget $6,500-8,500 to build a first class, zero timed, engine. –Cooling: The Corvair has a factory cylinder head temp limit of 575F. This is the highest limit on any mass-produced air-cooled engine ever built. The engine as also the first mass-produced turbocharged car. GM engineered the motor to have excellent heat tolerance and heat dissipation. In aircraft the engine typically runs at 325 to 350 CHT. – Parts availability: Every wearing part in the engine has continuously been in production for 5 decades. The engine pictured above, only has an original pair of cases, and oil housing and cylinder head castings. All other parts in the engine, including the crankshaft, are brand new. Many of the parts in the engine, like the lifters and valve train, are common to Chevy v-8s. There is no part availability issue. – Ignition: The fleet of flying Corvairs is about 500 aircraft. More than 90% of them have a dual ignition system that I have built. Our system uses two redundant systems, one points based, the other a digital electronic system. The design has two of every part potentially subject to failure, but it utilizes one plug per cylinder. Six cylinder engines can fly on one cold cylinder, most 4 cylinder engines can not. Plug fouling is unknown in Corvairs because the ignition system is 40,000 volts and uses a plug gap twice as wide as a magneto system. – Fuel: The Corvair can use either 100LL or automotive fuel. It is not bothered by ethanol in the fuel.When Corvairs were designed, car gas was a lot like 100LL; for the last 35 years every mile driven by Corvair cars was done on unleaded car gas. Many engines like 912s and modern car engines do not have exhaust valves that can withstand the corrosive nature of 100LL. We use stainless and Inconel valves in Corvairs. – Maintenance: The Covair is low maintenance. The heads never need retorquing. The valves have hydraulic lifters and never need to be reset or adjusted. I dislike the term “maintenance free”, because it implies a “no user serviceable parts inside” disposable appliance mentality. The Corvair is a solid, robust, machine which holds its adjustments, but our program is aimed at teaching builders to be self-reliant owners. 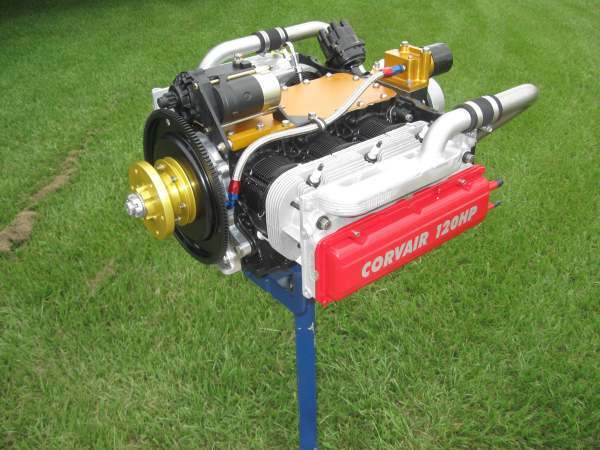 – Goals: If one of your goals is to be the master of your engine and airframe, the Corvair is an excellent choice. There are many engine options for people who just want to buy something. Our efforts are aimed at expanding the personal knowledge and skills of each builder. – Made in the USA: In an era where everything seems imported and companies like Continental have been sold to the Chinese Government, We have kept the “Made in the USA” option for builders who prefer to employ fellow Americans. Virtually every part in the engine, with small exceptions like the distributor cap (made in Mexico), are made by American craftsmen. Because we also sell engines outside the US, we are a Net Exporter, helping correct the trade imbalance. Corvairs have proven themselves to serve a very broad variety of builders. Many alternative engine options are offered only as a “buy it in a box” import, more of an appliance than a machine, with little or no consideration of the builders, skills goals, needs, budget or time line. The Corvair has options to address these valid considerations, because your power plant should conform to you, not the other way around. If you came to experimental aviation to find out how much you can master, not how little, then you are among the aviators who follow Lindbergh’s timeless 1927 quote: “Science, freedom, beauty, adventure: what more could you ask of life? Aviation combined all the elements I loved.” Even if you are brand new to aviation, I am glad to work with you. I have a long history of working with builders of all skill levels. We have a number of successful builders out flying who are the masters of both their airframes and engines, who had never changed the oil in a car before building their plane. If you got into experimental aviation just to buy stuff, then any salesman will do just fine for you. If you got into experimental aviation to learn, develop your own skills and craftsmanship and make things with your own hands, then who you work with really matters. You can’t become and old school homebuilder / motor head by buying things from salesmen. They have nothing to teach you. What you will do in experimental aviation is not limited by what you already know. It is only limited by what you are willing to learn, and selecting experienced people to learn from. If you are here to learn, I am here to teach. It is that simple. We have an overview of the combination search this term and read all about it. I have a corvair engine that’s in need of the works. Ultimately I’d like to see if I can match it with an all metal airframe, taildragger, with the side-by-side cockpit. I’ve been studying toward a plane I can fly cross country with a friend. I like the Sonex but it’s out of my price range, the Thatcher sx5 isn’t a good match from what I’ve read, composite materials are too expensive for me and I just feel more comfortable working with metal. An aerobatic airframe would be ideal. Anything come to mind? I’m not dead set on using the Corvair but I have one I could start with. Pacing the investment is nearly a must for my budget also. Thank you! Curious if a 1963 102 hp corvair engine code ends in YN is a good one to start with to build to William Wynn specs? If not what should I be looking for? Thanks! Brent, we only use 164 cid engines. The 102 is only 145 cid. My conversion manual has all the letter codes of the correct engines to start with.